Prices are with the exception of the following; 10% service charge and 16% IVA Tax. Rental Includes: Spread across 3 separate villas; 12 Guest Rooms, 4 Ocean Front King Suites, 4 Garden Villa Double Rooms, 1 Guest Villa Master Suite, 1 Guest Villa King Room, 1 Guest Villa Double Room, 1 Guest Triple Room. Please inquire for television and film production or event pricing. Management reserves the right to approve all guests of Casa Aramara in advance of booking. All guest information is 100% confidential and private. Just 35 minutes from the Puerto Vallarta airport (PVR), at the Four Seasons Resort Punta Mita, Casa Aramara is located near the northern end of Bahia de Banderas. The only 5-star estate in Punta Mita is situated in front of its own completely private white sandy beach. Enjoy the best snorkeling in the area, or take a refreshing dip in the pristine rock-free waters right outside your door. 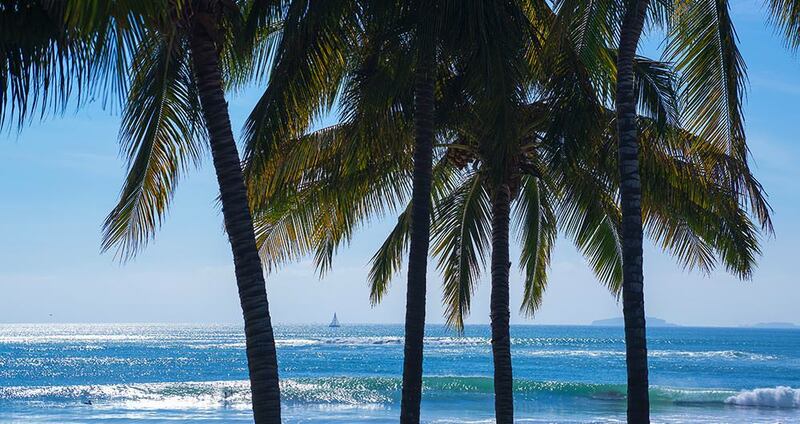 With 345 days of sunshine per year, Punta Mita is the perfect getaway destination. Puerto Vallarta has many non-stop flights and is serviced by Alaska, Delta, United, American, Aeromexico, Air Canada, Virgin America, South West & WestJet. Puerto Vallarta airport is also serviced by Aerotron (FBO), for our guests who prefer to fly private. Bedroom 5: 2 Bunk beds, 1 Single bed, En-suite bathroom with shower, Air conditioning, English Language HD Satellite TV, Apple TV with Airplay and Netflix, iPhone dock, High Speed Wi-Fi access, USB charging port, Safe, Mini-bar, Refrigerator. Bedroom 7 (Guest House Ocean View Pool King): California King size bed, Shared bathroom with Bedroom 8, Air conditioning, English Language HD 4K Satellite TV, Apple TV with Airplay and Netflix, DVD player, iPhone dock, Separate sound system with Bluetooth audio, High Speed Wi-Fi access, USB charging port, Electronic Safe, Mini-bar, Refrigerator, Ocean view. Bedroom 8 (Guest House Double Room): 2 Queen Beds, Shared bathroom with Bedroom 7, Air conditioning, English Language HD Satellite TV, Apple TV with Airplay and Netflix, iPhone dock, High Speed Wi-Fi access, USB charging port, Electronic Safe, Mini-bar, Refrigerator. Bedroom 10 (Garden Villa 2): 2 Queen beds, En-suite bathroom with shower, Air conditioning, English Language HD 4K Satellite TV, Apple TV with Airplay and Netflix, DVD player, iPhone dock, Separate sound system with Bluetooth audio, High Speed Wi-Fi access, USB charging port, Electronic Safe, Mini-bar, Refrigerator. Bedroom 12 (Garden Villa 4): 2 Queen beds, En-suite bathroom with shower, Air conditioning, English Language HD 4K Satellite TV, Apple TV with Airplay and Netflix, DVD player, iPhone dock, Separate sound system with Bluetooth audio, High Speed Wi-Fi access, USB charging port, Electronic Safe, Mini-bar, Refrigerator. The warm breezes and soothing ocean temperature provide a lovely backdrop to your stay at Casa Aramara. If you prefer to scuba dive, this time of the year is when it is most excellent. Water temperature averages 85 degrees Fahrenheit /29 degrees Celsius and air temperature is 85 degrees Fahrenheit/29 degrees Celsius. A beautiful temperate climate that averages 75 degrees Fahrenheit/24 degrees Celsius makes this a perfect time to enjoy all of what Casa Aramara has to offer. Whale watching is in full swing from December to March when the majestic humpback whales pass through the bay on their migration. You can actually see them frolicking in front of the house or get even closer with a quick boat ride.